We didn’t have resurrection eggs growing up. I’m not sure if the first ones were from Family Life, but I know they started selling them in 1995. My 4-year-old granddaughter, Zoey, has given me a true appreciation for the eggs. And observing her has helped me come up with a Montessori way to use resurrection eggs. 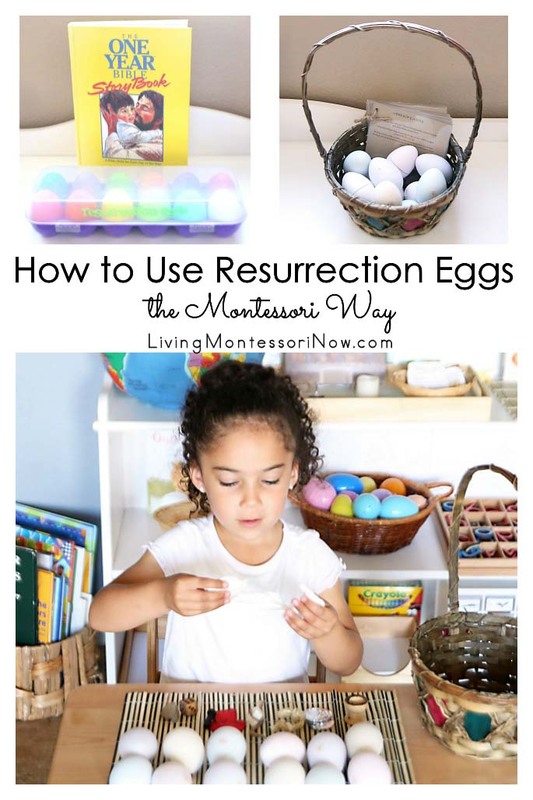 Resurrection eggs aren’t part of Catechesis of the Good Shepherd or Godly Play, but I think they go well with both Montessori-based religious education programs. 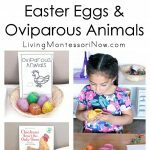 The more I read about resurrection eggs in the last few years, the more I knew my granddaughter would love them. She was three years old when I first bought the set from Family Life. I debated about the best age to introduce them because of the details in the crucifixion story. In many ways, I think the content is best for kindergarten age on up. 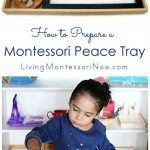 But the sensitive period for an interest in small objects and details is ages 1½-4. Zoey has been obsessed with small objects since she was a baby. 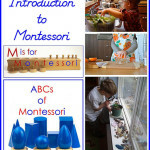 I used sensory bottles, boxes, and bags so that she could explore small objects safely from a young age. 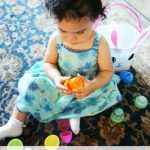 Zoey has also been in love with plastic Easter eggs since she got a number of them in an Easter basket at 17 months. 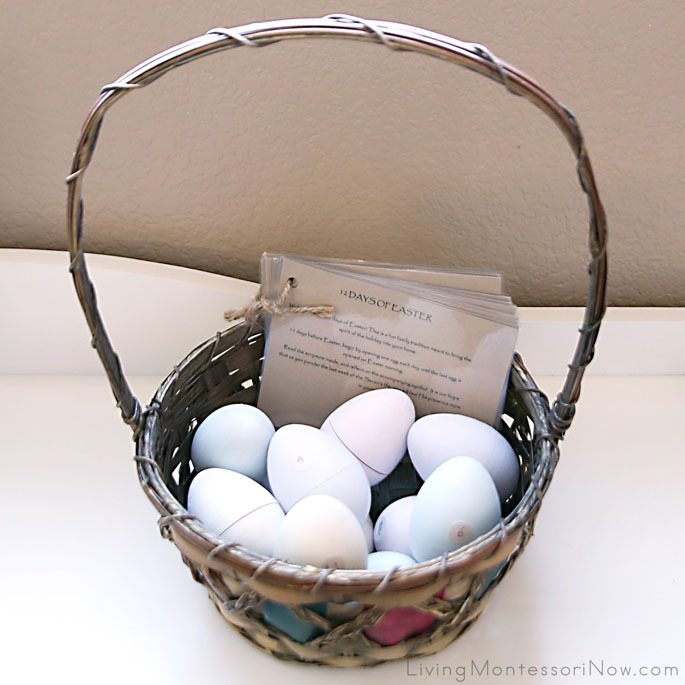 After I observed how much she loved the plastic eggs, I recycled all the Easter eggs I had for an Easter egg open and close basket. I store my seasonal and holiday materials in storage drawers in my garage. Zoey has often gotten out the plastic Easter eggs at various times throughout the year because of her love of them! Because of Zoey’s love for both plastic Easter eggs and small objects, I introduced the Resurrection Eggs at age 3. I simply let Zoey open each egg (which I asked her to find by color). I paraphrased the story in the booklet that comes with the eggs to make it shorter and more appropriate for a 3 year old. I found that Zoey didn’t mind the content of the story and absolutely loved the eggs. I kept them on the shelf for her to explore during Lent. She often asked me to read the book while she opened each of the eggs. The Resurrection Eggs were the other Easter material that Zoey got out of my garage storage a number of times throughout the year! 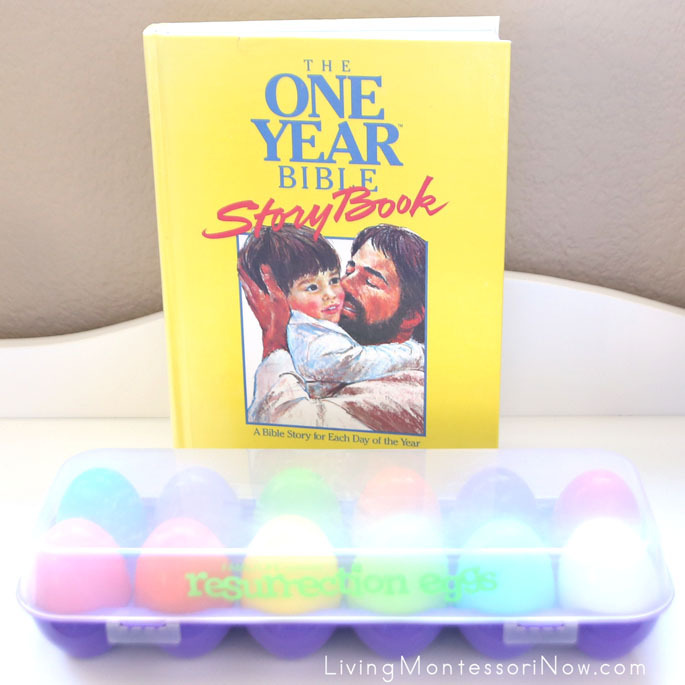 There are a variety of ways to use resurrection eggs, but the first egg is traditionally introduced 11 days before Easter with one egg and the accompanying scripture each day after that through Easter Sunday. Other families open them all on Easter morning. Some families use them for a scavenger hunt. I still don’t introduce one egg each day. Zoey’s preference is to go through all the eggs each time, so I follow her interests. 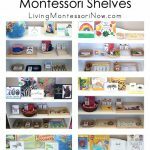 Following the child’s needs and interests is really the Montessori way, so I use that as my primary guide always. I also like having the resurrection eggs available on the shelf for a child to repeat over and over again according to the needs of a sensitive period. This year I added another set of resurrection eggs to our shelf. These are called the 12 Days of Easter eggs and are beautiful, handmade wooden eggs available on Etsy. 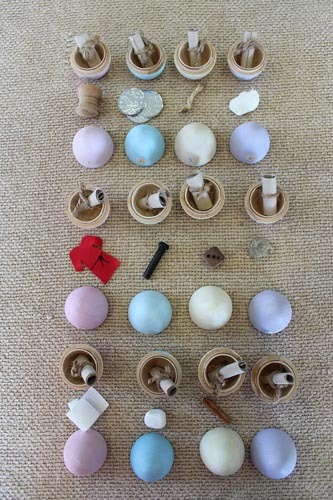 They’re more expensive than the plastic eggs, but they’re a Montessori-style wooden product with natural finishes. The plastic set would have been fine, but I wanted to get a special wooden set because of Zoey’s intense interest in resurrection eggs. That’s typically how I choose which materials to get higher quality versions of rather than using printables or a DIY version. Some of the objects are different in the two sets, so there’s also a variation in the scriptures used. I simply added the eggs and booklet to an Easter basket on the shelf. With these, Zoey laid out the eggs from 1-12. She again opened each egg as I read the accompanying scripture. 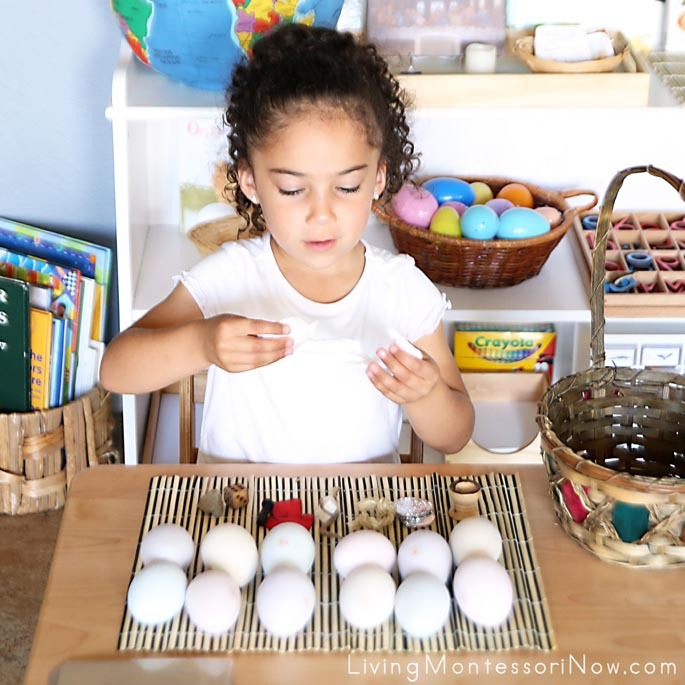 I love that her Montessori work has developed her sense of order so that she placed each object in a row after opening the eggs. I checked the eggs after Zoey had put them away, and all the objects were placed back in the appropriate eggs! I know that both sets of resurrection eggs will get lots of use over the years. I’ll plan to add more details when Zoey is a bit older. The main thing is that I’ll continue to observe her needs and interests (and my other grandkids’ needs and interests when they’re old enough for the eggs). That’s how I’ll decide the best way to use the eggs each year. Have you used Resurrection Eggs? 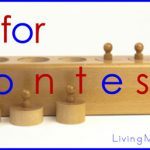 Do you have a favorite way to use them? 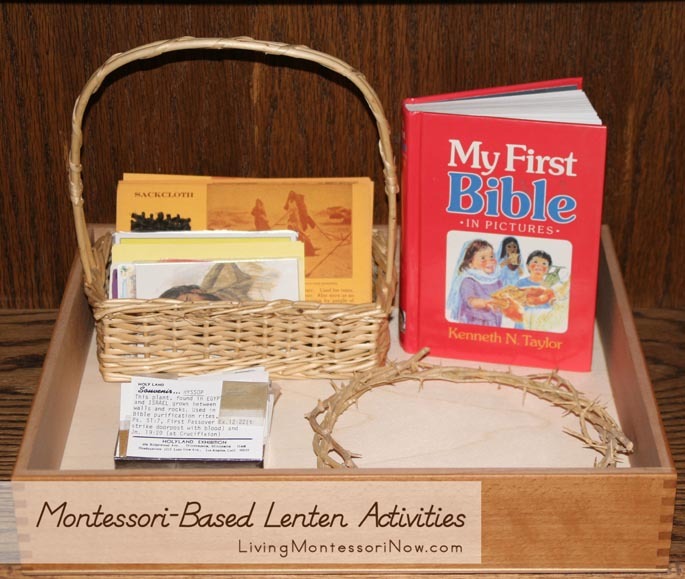 You’ll find a variety of Godly Play and Catechesis of the Good Shepherd activities for Lent and Easter in my Montessori-based Lenten activities post.